This machine utilizes Cognex and EZVision systems to confirm the presence of tapped holes in parts. The operator will select the part type through a PanelMate Operator Interface. 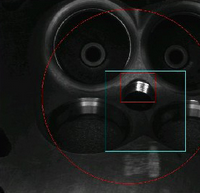 The machine will then automatically determine appropriate inspection set depending on part type.